KRAFT Macaroni & Cheese is changing the way kids make macaroni art. Along with its "Dinner, Not Art." 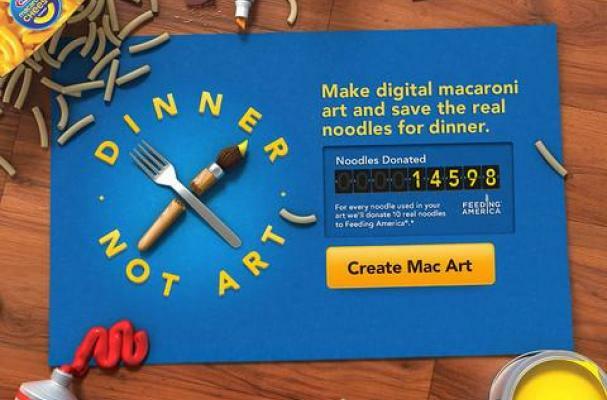 campaign, the company has released a free iPad app (desktop and laptop versions coming soon) for kids and parents to create digital macaroni art and "save the real noodles for dinner." As well as saving thousands of macaroni from an inedible, paint-and-glue-soaked doom, KRAFT is letting the artists be the heroes. Until December 31, 2012, every digital macaroni noodle used in saved art within the app will translate to 10 real noodles donated to Feeding America, a nationwide network of food banks. Digital noodles can be chosen based on shape, such as curved versus straighter macaroni. The KRAFT Mac & Cheese Facebook page will feature select saved art. Learn more about the app on the official page for "Dinner, Not Art."